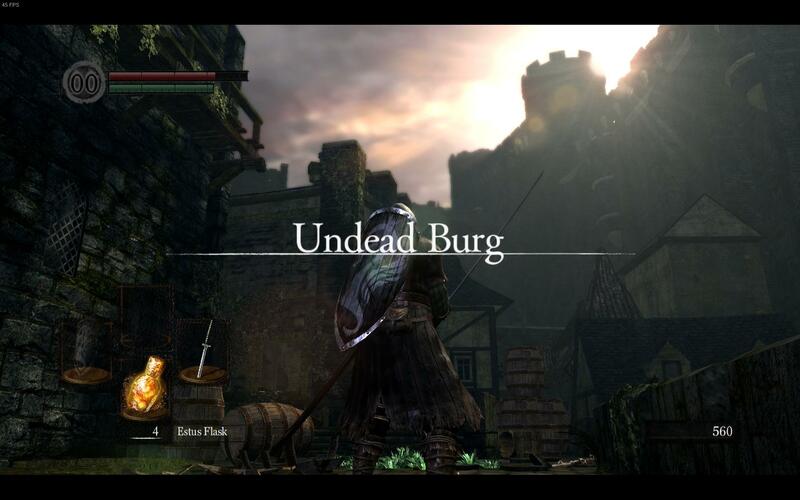 At first glance, Undead Burg doesn’t appear to be anywhere near as dreary as its name would suggest. First impressions can be deceiving. 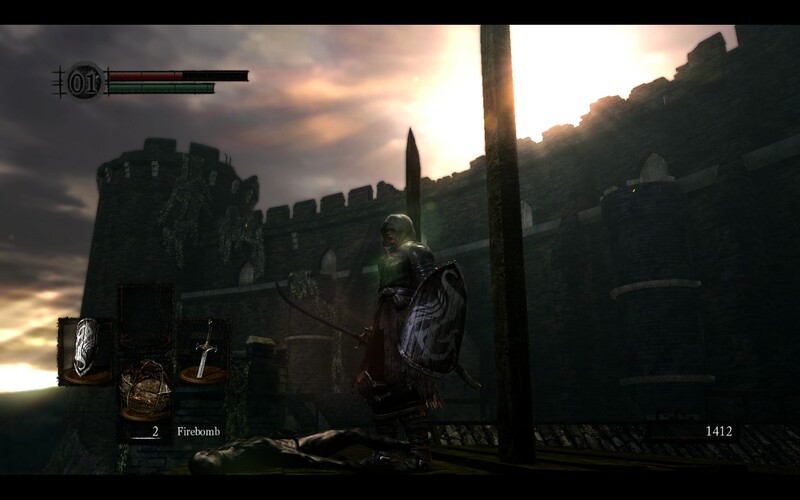 The bright and cheery skyline visible in the screenshot above quickly become obscured by dark stone walls, forcing me into conflict with the permanent residents of this particular burg. I can only assume that this is the path I’m supposed to take early in the game, seeing as every other avenue I tried saw me skewered in a matter of moments. If my assumptions are correct, then this twisted medieval version of suburbia is the player’s “real” initiation into the world of Dark Souls. If you can survive here, then you just might have what it takes to survive farther into the game. I don’t know if I have what it takes to survive farther into the game. After a half dozen enemy encounters with results ranging from limping victory to terrible bloodbath, I realize that I still have no clue what I’m doing. Let me give you an example: Undead Burg has a shopkeeper where you can trade items and buy supplies. I accidentally killed him. In the fifteen to twenty minutes it took me to battle from the burg’s entrance to his shop my mind was in a state of combat readiness. When I stumbled into his shop, hidden behind a mess of crates and barrels I was on edge and ready to respond to the slightest stimuli with a flurry of violence. That poor shopkeeper thought the best thing he could to do a well-armed traveler that bursts through the door is start talking. I had to respond somehow. I pressed a button that I thought was supposed to initiate interaction, but I pressed the wrong one and whipped a throwing knife at his face. He doesn’t want to sell me things anymore. In one enraged motion, he came crashing through his table and lunged towards me. I’m forced to defend myself against who I assume is the only one able to sell me supplies in this location. This shop is now closed permanently. No friends do I have in Undead Burg. All because I pressed the wrong button. Controls, controls, I must learn the controls. 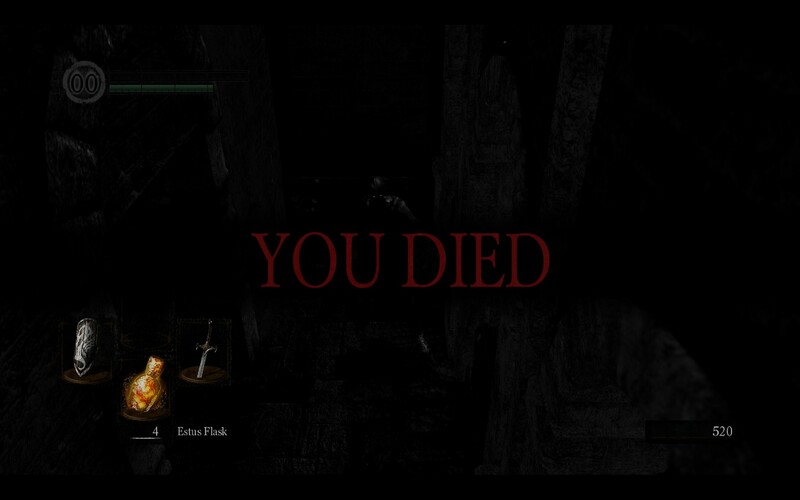 If you ever want to play the PC version Dark Souls for yourself be forewarned that using the mouse and keyboard is horrible and clunky. That’s why I’m playing with a wireless Xbox 360 controller. For the most part, the default layout seems pretty intuitive. The left stick moves my character. the right rotates the camera. Clicking the right stick will snap the camera to face the same direction as my character. Clicking the right stick in close proximity to an enemy will “lock on” to that particular foe, making them easier to track in the heat of combat. The front bumpers and triggers correspond somewhat to the left and right sides of my character’s body. My character’s left arm holds a shield. The left bumper brings up the shield for a block, left trigger swipes the shield in an attack. My character’s right arm is used for offense. Press the right bumper for a light attack that you can recover from quickly, use the right trigger launches a heavy attack appropriate for the type of weapon currently wielded. 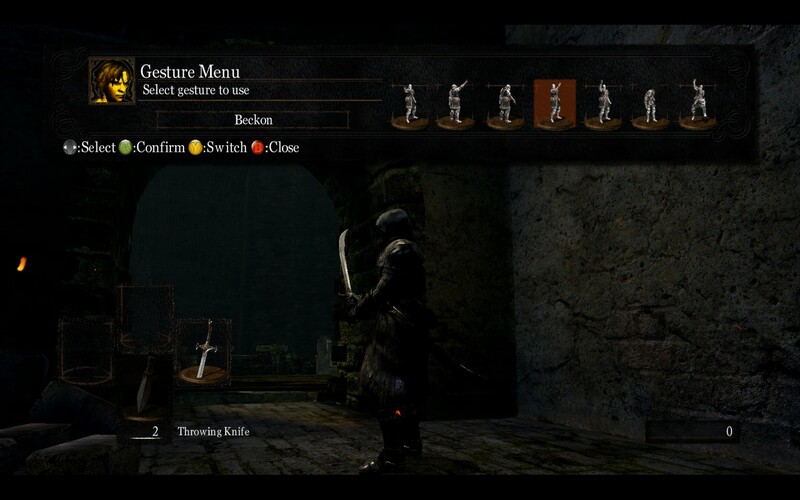 The D-pad corresponds to four inventory slots. Pressing a given direction allows you to equip or unequip items in that slot. Moving on to the face buttons: Y will switch between a one-handed or a two-handed combat stance. When using a two-handed stance pressing either the left trigger or left bumper will allow you to use your sword to block. Pressing B while motionless allows you to jump backward, or roll in whichever direction you happen to be moving. Holding B down allows me to sprint. While sprinting, press B again to jump. X uses whatever item is currently equipped. A. What does A do? Aside from using it to confirm selections in the menu I haven’t stumbled upon any use for the A button. I hope I haven’t missed anything important. Pressing Start brings up the standard in-game menu. Not so standard is the realization that bringing up the start menu does not pause the game. On more than one occasion I’ve brought up the menu to change a setting or check the options, only to have an enemy wander towards me from off camera and start pounding me. I vainly start mashing my attack and defend buttons only for my character to stand motionless and take his punishment. Lesson to be learned: Combat does not work with the menu is open. I can’t tell why the game was developed this way. Probably to punish poor saps like me who just have trouble figuring things out. Hopefully, familiarizing myself more with the control scheme will make me ever so slightly more efficient in combat. I’ve been stuck in Undead Burg for a while now and have only managed to light one bonfire at what I presume to be the halfway point. By now I’ve tried to progress through the city about a dozen times, dying with alarming frequency. For a while I manage to hold my own against the undead masses. Each battle may be hard and furious, but I can usually take out a few groups of enemies and restore myself to nearly full health with a drink from my Estus Flask. My confidence starts to wane when I approach an unsettling trio of skeletons, each armed with a long pike and shields that look like they’ve been carved from solid granite. They’re different from the mindless drones I’ve had to plow through until now. Backing slowly away from the group, one follows me up a stairwell and paces side to side slowly. He’s taunting me, waiting for me to make the first move. I make the first move. I die. Thinking that maybe I ought to try a weapon other than my light but fast curved scimitar, I try to equip a broadsword. Nope, can’t use that one with only one hand. My strength stats are too low so this is something I have to use with both arms. I’m going to have to step out of my comfort zone and forget about using a shield for a while. The first dozen or so enemies I run into die with a pleasing lack of resistance. 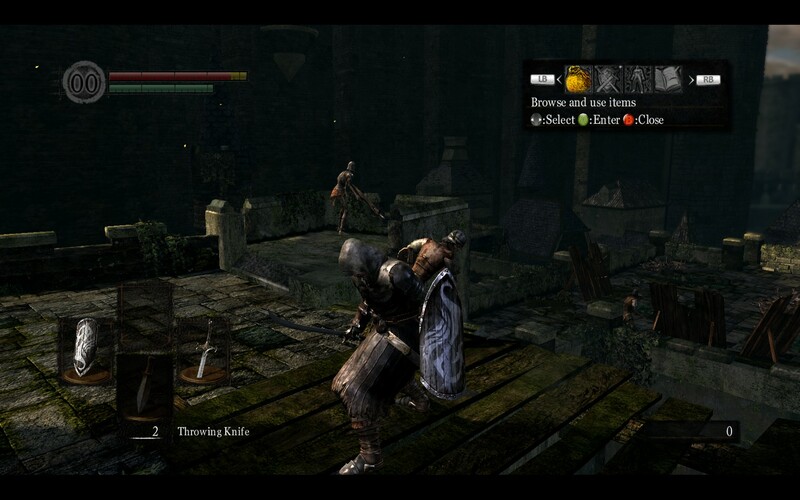 Even the trio of spear-laden, granite shielded skeletons can’t hold me back. I make my way up a stairwell and down a few more corridors. I try passing through a doorway shrouded in white fog, “Traverse the white light”, it says. That can’t possibly lead to anything bad, could it? Taurus Demon? TAURUS DEMON? 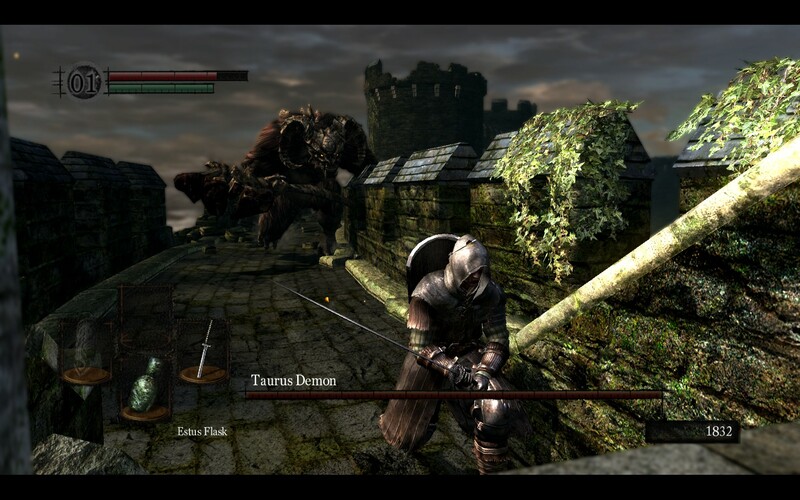 There’s a boss fight on a freaking parapet walk? And there are snipers firing at me from behind? And I don’t have any healing juice left in my Estus Flask?